What if you had the ability to personalize your coffee in over 5.2 million different ways? Well, with our 7 coffee blends and more than 35 flavor choices at Rutter’s, you can! Fresh Half & Half and milks from our own Rutter’s Dairy, Silk Almond and International Delight Creamers, flavor syrups made from 100% cane sugar, sweeteners that include Stevia and Raw Sugar, and a host of toppings to finish it off…We Have It All! Which coffee is for you? 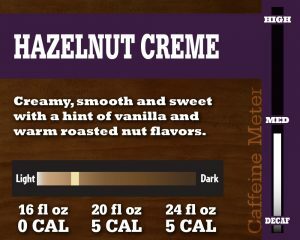 Our newly designed flavor cards will provide you with all the details you need to select the right brew for you. In addition to the name, description, and roast meter, we have added caloric charts and caffeine meters specific to each option. Check out our great tasting, high quality blends that will never leave you disappointed. This signature Rutter’s blend contains both Arabica and Robusta beans from Colombia, Central America, and Brazil. Classic is a lighter roast that offers a full-bodied, mild coffee with a rich aroma and higher than average caffeine kick! The second of our two signature coffees, our Premium house blend, utilizes 100% Arabica beans from Africa and Indonesia. This medium roast delivers a rich, bold taste with an enticing aroma. Its name says it all, as it truly is a premium coffee! It’s BACK! Rainforest 100% Colombian Coffee has returned to our award-winning coffee lineup. This blend contains 30% Rainforest Alliance Certified beans from Colombia carefully blended with other Colombian beans to create a medium-bodied coffee with bright acidity and a clean finish. Rutter’s Dark Roast Coffee is a select blend of beans designed to deliver the bold, full-bodied experience of a true dark European roast. Also provides a great “pick-me-up” as this is our highest caffeinated offering. Our new naturally decaffeinated coffee is a blend of beans from Central and South America that results in a medium-bodied coffee with a smooth mellow flavor. What makes a naturally decaffeinated coffee better? In order to remove caffeine from coffee, most beans go through a process that involves using one or more chemicals, such as methyl chloride (also widely used as a refrigerant). These chemicals also remove much of the natural flavoring. Caffeine is removed from our decaf blend using a water based process, thus eliminating unwanted chemicals and leaving the natural flavors intact. Rutter’s Hazelnut Creme coffee is back and here to stay. This sweet and nutty blend is the perfect offering for a pick-me-up in the morning or an afternoon treat. Try our Seasonal offering: Buttered Rum Cake Coffee! This blend featured flavored of fresh baked butter cake enhanced by rum, cinnamon, nutmeg and cloves.